Clay bricks suitable for use, plastered or unplastered, for general building work below damp-proof course or under damp conditions or below ground level where durability rather than aesthetics is the criteria for selection. 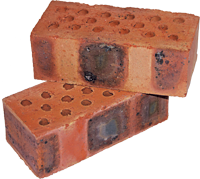 At times, depending on production conditions, we have stock of standard/imperial sized clay bricks that have been fired at hotter conditions and for longer than is necessary for classification as NFP or NFX. Consequently, they are usually imbued with a rich red/purple hue or colour and may be used as a rustic, semi-face brick. Because the colour varies from batch to batch and the quality is very rustic in comparison to purpose-made face bricks, we advise you to visit our premises to view available stock before placing any firm orders for this product. Vertically perforated product – no unsightly voids on window and door reveals. Labour savings – not necessary to plug corner voids before plastering compared to horizontal perforations. Aluminium window and door frames can be fixed with standard wall plugs. Heavy mountings/safes can be fixed with rawl bolts – brick does not have internal voids compared to horizontal perforations. Smooth finish means garages can be bagged finished – savings on plastering. Robot setting with process control ensures consistent quality lower mortar usage and ease of plastering. Palletised and shrink wrapped – lower site wastage and pilfering. Modern tunnel kiln fired using embodied energy – low emissions. All clay raw material is mined on site, blended with zero waste. Mined areas are rehabilitated to original agricultural state. Where possible production processes are scheduled for off-peak periods to help reduce demand on the National Electricity Grid. Energy to fire our Clay products is sourced as a by product from Saldanha Steel. Drying energy is derived from waste wood from a local pallet hiring company. The Plant is automated which means no forklifts are used to move bricks within the production process, leading to fuel savings and emission reduction. Bricks are perforated (dematerialization) in a staggered design that retains structural strength, while minimizing clay usuage, thereby reducing required energy costs. Lighter, stronger product translates to savings in building design as the structure bears less load. As bricks are lighter, considerably more product can be transported to site, meaning a reduction in vehicle numbers and therefore lower emissions per square meter of walling. Bricks are palletised at 600 units per pallet as compared to the standard 500, leading to less pallet wood usuage and a reduction in shrink wrap and improved site management. Our uniform brick requires less mortar to lay and reduces site wastage. The favourable geographical location of our factory gives us the advantage to easily and efficiently reach major Cape Town building sites.